Its always good to hear customer feedback and this is what makes the job so enjoyable for us. Graham and Alison from WA recently picked up their new Discovery and its now on its way to Perth see their customer feedback below. Well have been having a fabulous time in our Discovery, we spent the days at Maroochydore at Bunnings, BCF, Cheap Autos etc getting set up. We have since moved on to Bundaberg and currently at Rockhampton. The 15ft Defender hybrid now comes standard with a new improved revamped kitchen. Complete with our cleverly designed extended fridge slide incorporating a huge pots & pan storage compartment with sliding top drawer, two large pantry drawers, a large utensil drawer, under sink storage compartment and huge fold over work-bench. A great looking kitchen with heaps of storage and bench space all sliding out effortlessly from the side storage compartment. 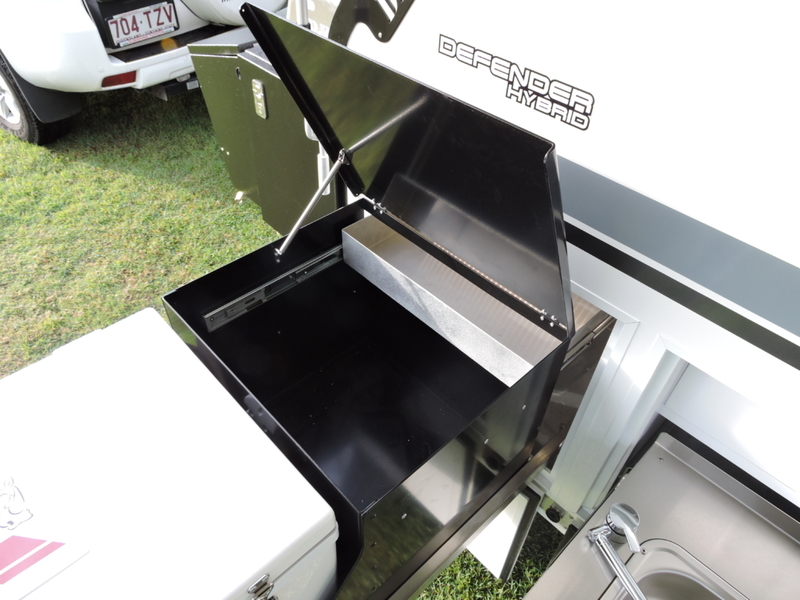 The new Rhinomax Defender Hybrid has arrived and promises to make a major impact on the premium hybrid camper sector. Following on from the success of our 10ft Scorpion and 14ft Discovery hybrids the 15ft Defender will reset the benchmark and raise the bar in the premium hybrid sector. The new Rhinomax Defender Hybrid will be released soon and promises to make a major impact on the premium hybrid camper sector. Complete with a full size internal ensuite with shower & toilet, push button electric roof opening, expanding external kitchen, huge wind out awning and plenty of internal and external storage areas the Defender will be sure to impress. For more information or to book a production spot give us a call. 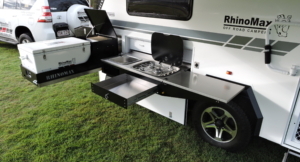 Another great review from the industry experts for Rhinomax Campers. Caravan Camping Sales have just reviewed the Scorpion and they loved it. 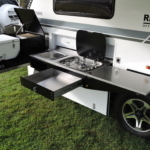 New hard shell camper resets the parameters for micro hybrids. The Rhinomax Scorpion is one of the biggest things in Australian camper trailers for years. Thoughtful design is an area where the Scorpion excels. The Rhinomax Scorpion stands apart in this growing ultra-competitive market segment for its innovative design, combined with high quality construction and competitive price. 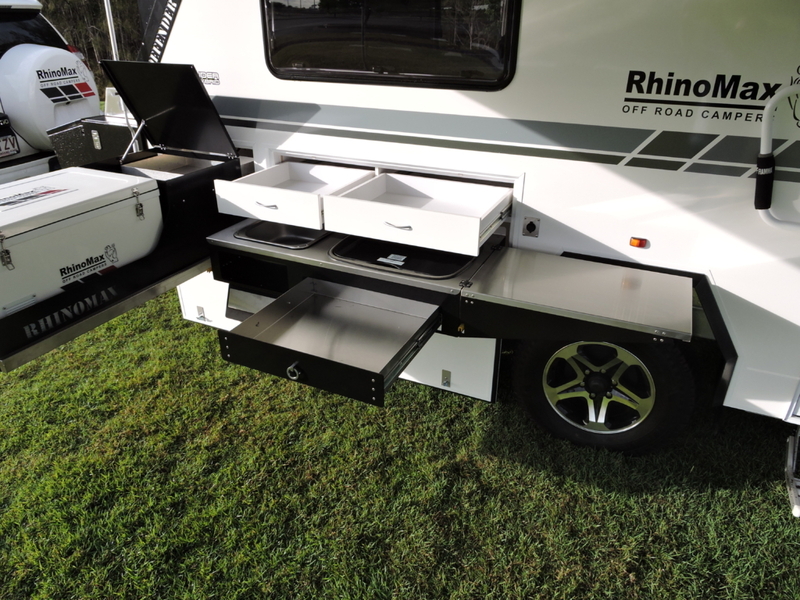 Our South Australian agents Mike & Anita from the Dirt camper trailer sales & hire will have the Rhinomax range of hybrids on show at the Adelaide caravan & camping super sale July 28 – 31 so why not come down and see why Rhinomax are consistently rated by industry experts as the best built campers in Australia. Read the latest review for the Discovery Hybrid in the June/July issue of Caravan + RV magazine, available in the newsagents now. They were blown away with the engineering, build quality and finishing and rated it as the best they have seen. With new models just released and two more on the horizon, we are taking this opportunity to spread the love across the whole range. Items, which were once classed as extras are now standard fitment, and the design team has introduced the next level of innovation across all the models. From July the 14th new pricing will come into effect. Anyone wanting to secure one of our models at the current price contact sales before this date. Rhinomax Campers will be exhibiting at the QLD Caravan, Camping & Touring Super show at the Brisbane showgrounds and invite you to come along and say hello. Check out the all-new 2016 Discovery Hybrid and see why it has reset the benchmark for premium hybrid campers and the recently released Scorpion Micro Hybrid, it really is a big idea condensed. 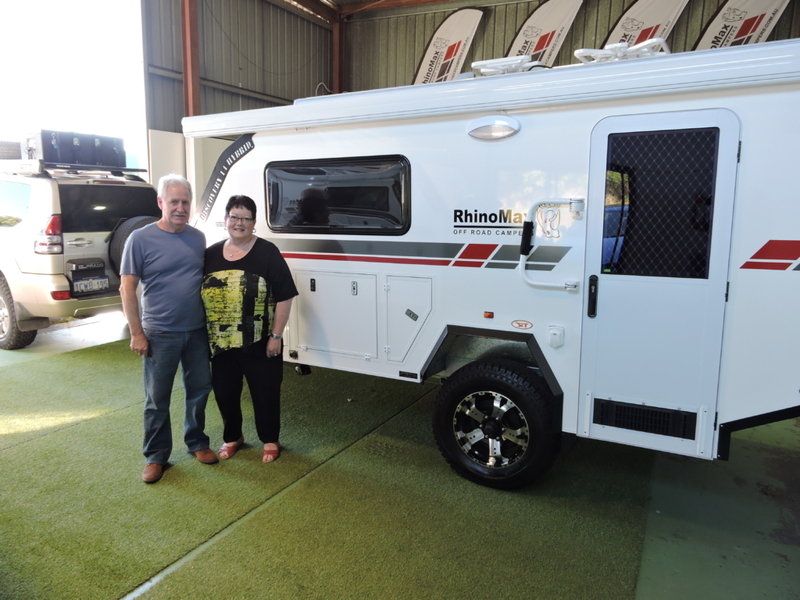 Rhinomax Campers are pleased to announce the addition to our team Mike and Anita Pavey from “The Dirt Camper Trailer Sales & Hire” who have recently been appointed our new dealer for South Australia. 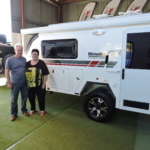 Mike and Anita have a wealth of experience in the off road camper industry, have travelled extensively in the outback and we are extremely happy to have them on board. If you are in South Australia and would like further information on our award winning range of campers why not give Mike and Anita a call.